The books were hidden underneath a wooden floorboard for over 75 years. The items are therefore very fragile and show signs of water and mold damage. Mozes Schenker was born in Belz, Poland, on 10 November 1896 as the son of Hersz Schenker and Have Fischer. On 28 February 1925, Mozes travelled to Lemberg to collect his Polish passport at the local police prefecture. Two months later he visited Czechoslovakia. The Belgian delegation in Prague provided him with a visa valid for 15 days. Upon Mozes’ arrival in Brussels on 5 May 1925, he stated he was a travelling merchant in need of a permanent residence permit. Mozes also declared he migrated to Belgium to work in the leather workshop of his sister Sali Schenker (born in Belz on 10 November 1896) and his brother-in-law Majer Leib Kunstler (born in Przegrzany, Poland, on 12 September 1888). Initially, Mozes moved in with his relatives at 258 Chaussée de Mons in Anderlecht, Brussels. However, he then quickly got a job in the leather factory of N. Eilenberg. In June 1926, Mozes relocated to Aarschot, but by the end of the year he settled in Borgerhout, Antwerp. The following years he moved quite a lot within the city perimeter while earning a living as a worker in the diamond industry. In 1931, Mozes travelled to Salford, United Kingdom, where on 4 June he married Rebecca Sufrin (born in Manchester, United Kingdom, on 23 January 1901 as the daughter of the Romanian couple Isidor Sufrin and Adela Apfelbaum). However, Rebecca had to await the arrival of her papers and was only able to join Mozes in Belgium in November 1933. Because of her marriage, she lost her British nationality and took on Mozes’ Polish nationality. The couple was very religious. Apart from working as a diamond clover, Mozes also became a private teacher in Hebrew languages. In 1934 the Schenker-Sufrin family moved to a rental apartment at Karel de Preterlei 168 in Borgerhout, Antwerp, where on 23 October 1934 their first child, a son named Naftali, was born. Rebecca gave birth to three more children: a daughter named Zelia on 13 June 1936, a second son named Israel Samuel on 2 June 1938 and a third son named Markus on 22 March 1940. On 10 May 1940, Nazi-Germany invaded Belgium. During the following two years the German authorities installed 17 anti-Jewish decrees. Mozes obeyed all these orders: he registered himself and his family in the municipal Jewish Register at the end of 1940, he had his ID card stamped with the words “Juif-Jood” in 1941, he became a member of the Association of Jews in Belgium in April 1942 and he bought the yellow star in June 1942 for himself, his wife and two oldest children. Meanwhile, the Schenker family tried to live a normal life. By 1942, oldest son Naftali was in the first grade of the religious Jesode Hatora primary school. His sister Zelia had started attending the girls school there in September 1941, while Israel Samuel attended the kindergarten at the grounds as of June 1942. In the summer of 1942, the German Arbeitsamt arrested Mozes and sent him to northern France where he was forced to work on the construction of the Atlantic Wall together with 2.251 other Jewish men from Belgium. The construction works were supervised by Organisation Todt and Mozes was first put to work by subcontractor Ph. Holzmann, later by subcontractor Leonhard Hanbuch und Sohne. During this period Mozes was detained at a work camp near Bologne sur Mer. It is probably in France that he learned about the arrest of his wife Rebecca Sufrin. She was arrested during the third large anti-Jewish raid in Antwerp. This raid was organised during the day on 11 and 12 September 1942. Rebecca was registered alone at the Dossin barracks on 11 September 1942 as person 732 on the deportation list of Transport IX. The children were not with her when she was arrested. They stayed behind, by themselves, in the family apartment at Karel de Preterlei. Naftali Schenker was 7 years old, Zelia 6, Samuel 4 and Markus only 2. The train carrying Rebecca left the Dossin barracks the day after her arrest, on 12 September 1942, and arrived at Auschwitz-Birkenau on 14 September 1942. Rebecca Sufrin did not survive. Mozes Schenker was able to return to Belgium. Perhaps he was released from the labour camp because of illness, perhaps he was able to escape or was sent back to Antwerp because his children were unattended. On 9 October 1942 dozens of Jewish families were arrested all over Belgium. Men, women and children were loaded onto waiting trucks. Among those arrested were Mozes and his children. One of the neighbours recalls how youngest child Markus was taken, wearing only one shoe. The Schenker family was transferred to the Dossin barracks and registered on the deportation list of Transport XIII which left the Dossin barracks the following day, on 10 October 1942, and arrived at Auschwitz-Birkenau on 12 October 1942. Transport XIII stopped at Kosel, several dozen kilometres from Auschwitz, and all able-bodied men were hurdled out of the train there to be sent to the labour camps surrounding Auschwitz. It is possible that Mozes was separated from his children there. He might have succumbed in one of the labour camps, but if he stayed with his children he was probably sent together with them to the gas chamber upon arrival. None of the Schenker family members survived deportation. 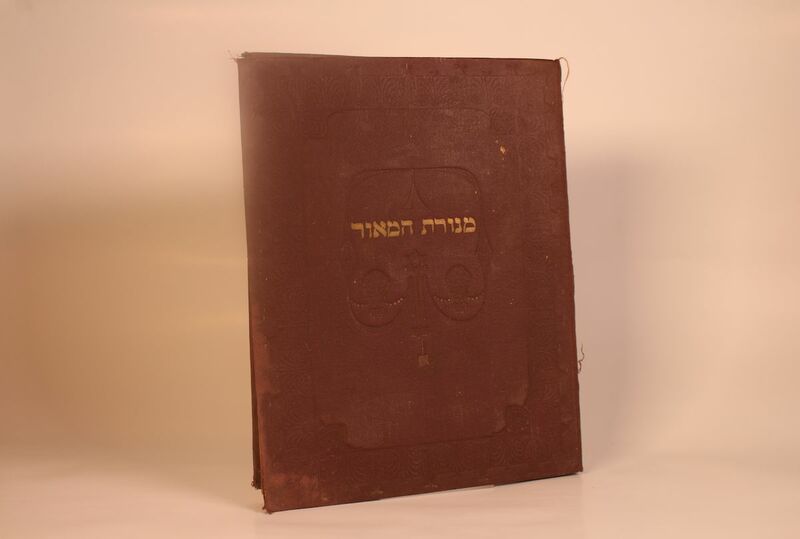 The nine books in the Mozes Schenker collection were discovered during construction work done in 2018 by Cindy Doolaege and her husband Farouk El Afi, current owners of the house adjacent to the building where the Schenker family rented their appartment in 1934-1942. The book collection was hidden - probably in 1942 - under the wooden floor in the attic of the neighbouring house. While researching the fate of the owner of the books, the El Afi-Doolaege family contacted Kazerne Dossin and kindly entrusted the books to the museum.